On 23-05-2008 at 1520UTC from the Plesetsk Cosmodrome in northern Russia (Site 133), a Rokot type rocket was launched into space. 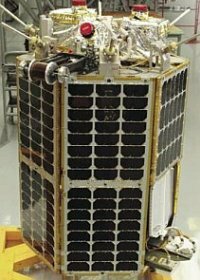 At a height of about 1450km, the main payload, 3 GONET D1M military satellite (Kosmos-2437, 2438 and 2439) where placed into orbit together with an amateur radio satellite Yubileiny (Radio Sputnik RS-30). This satellite was built by NPO PM of Russia during the 50th anniversary of Sputnik first. He weighs 45kg. Was developed by the satellite of the JSC “Academician MF Reshetnev” Information Satellite Systems “in cooperation with the Aerospace Vehicle Laboratory (Russia, Kaluga), RPE” Geofizika Cosmos “(Moscow), the JSC” Saturn “(Krasnodar), Lavochkin NPO (Moscow), the instrument Ramensk Building Company (Ramensk), Khrunichev State Cosmic Research and Production Center (Moscow) and the Siberian Aerospace University (Krasnoyarsk). The satellite Yubileiny is dedicated to educational, scientific research and experimental missions. First, the satellite launch will help to fulfill the Information Program foreseeing solutions of the major tasks of space exploration (voice messages, SSTV slides, signal imitation of the first artificial earth satellite); secondly it will help to establish conditions under which the Russian universities could study the data transmitted by the small satellite; and thirdly, it’ll help to carry out science-and-technologic experiments: Prospective Sun and earth sensors flight proficiency; Receiving data related to the Earth’s planetary emission within infrared wavelength band; Researches of spatiotemporal emissions of the Earth atmosphere day and night radiation within visible spectral range; Testing the estimation methods of the satellite attitude control concerning the data provided by the experimental solar sensors and small magnetometer MA-6; Proving efficiency of the nano-coatings developed by the SSAU to protect the spacecraft electronic components against radiation; Providing flight qualification for a prospective multifunction unpressurized platform intended for the 30-100 kg satellites; Testing the piggy-back injection (3 in a cluster) technology using the «Rokot» launcher. Structurally the satellite represents an unpressurized instrument module formed by a hexagonal frame with attached solar arrays and three lateral webs: top, bottom and central ones. The onboard equipment is installed inside the instrument module as well on the outer surface of the top panels. The top panel of the satellite that faces the Earth during the satellite operation is equipped with attitude control system devices, in particular, magnetometer and diagonal balancer booms, receiving and transmitting antennas and research equipment including three Earth sensors to receive data on the Earth’s planetary emission within infrared wavelength and spatiotemporal researches of the Earth atmosphere day and night radiation within visible spectral range. The spacecraft central panel carries the DOKA-B equipment comprising the onboard computer; receiving equipment operating in 145 MHz band; transmitting equipment operating in 435 MHz band as well as the onboard radio navigation equipment. The spacecraft bottom panel is equipped with magnetic and gravity attitude control system ensuring the satellite X-axis orientation towards the Earth in a nominal operation mode, navigation equipment antenna, experimental Sun sensors and the RADEK equipment, which is to prove efficiency of the nano-coatings developed by the SSAU to protect the spacecraft electronic components against the radiation impacts. Solar arrays panels installed on the satellite’s frame are made of the three-junction gallium arsenide cells. The solar arrays will supply power to the onboard equipment when in the illuminated orbits. The frame design allows the required size of the solar array effective area with the satellite being in different positions relative to the Sun. During the orbital eclipse periods the equipment is powered with the nickel metal hydride battery. The EPS battery is not an individual element. Its components are incorporated into the command and power unit where all power supply automatics is installed, these are the DOKA-B equipment components. The peculiarity of the «Yubileiny» lies in its passive thermal control subsystem: the necessary temperature is provided by the uncontrolled ratio of optical coefficients characteristic for the surfaces of spacecraft structural elements, MLI, electric heaters and heat pipes that ensure the thermal mode for the DOKA-B equipment. The DOKA-B software ensures electric heaters control which is as follows: if the temperature sensors indicate temperature fall till 0°C then the electric heaters are switched on, if the temperature rises up to 5°C, the electric heaters are switched off. The flight software estimates an average temperature according to data of the three temperature sensors. The electric heaters are controlled considering the average temperature. 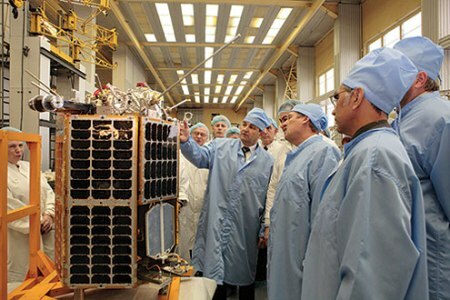 The satellite «Yubileiny» is injected in a cluster with satellites developed for the Russian Ministry of Defense. In 30 seconds after the satellite separation from the ascent unit the initial preparation mode is switched on. Above all, the DOKA-B powers the pyro cartridge to deploy the145.8 MHz antennas, makes the receivers ready to get the ground control commands, and supplies power to the magnetometer coil. Then the attitude determination and control system undergoes damping and magnetic orientation. In total, it takes no more than 4 days to accomplish all operations. After conformation of the stable magnetic orientation mode within the radio visibility range the Satellite Control Center sends the commands «current coil off», «HDM release» and «moving out» the diagonal booms. The gravity boom is passively moved out, the diagonal booms are deployed and the spacecraft comes into 3-axes gravity orientation mode. It takes 1 day to damp the satellite till it reaches the stable gravity orientation after moving out the gravity boom. After checking the satellite systems, the data related to the first artificial satellite launch is downloaded. The transmission lasts for 4 minutes. 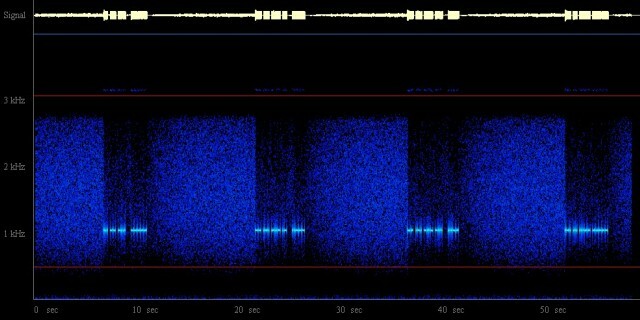 Within this time the following data is downloaded: a call signal and TM-data (10 seconds); a voice message (1 minute); a pause (50 seconds the first artificial satellite imitated signals (10 seconds); an image (1 minute); a pause again (50 seconds). The onboard spacecraft data is transmitted via a radio channel in the 435 MHz international frequency band of experimental and radioamateur communications, in cyclic mode, in narrow-band FSK mode. Voice messages and images can be received in any place of the Earth when the satellite floats above within the radio visibility ranges. Any standard radio equipment can receive the signal in this frequency band requiring no additional technical means. The onboard navigation equipment is switched on once a day for 10 minutes to determine, without the ground support, the parameters of the spacecraft motion along the near earth orbit. The onboard equipment meant for the satellite-based navigation can use the signals of GLONASS and NAVSTAR (GPS) systems in any combination.